Tank sizes range from 200-5000 gallons. Use your water buffalo on public roads or just your facility. Dually axle trailers, air brakes are just some of the options you can select from. Be Ready for Your Fresh Water Delivery Needs. A water buffalo or water wagon is a product to store and transport water for livestock, farms, ranches, industrial facilities and auxiliary fire prevention. A water buffalo does not use a pump. Water is gravity fed to your required location. NSF compliant tanks and lines available for drinking water. 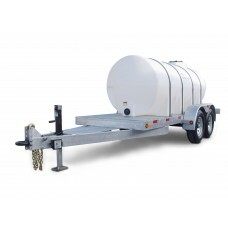 Tank sizes are available ranging from 200 gallons to 5000 gallons. Water buffalos do not include pumps, valves or piping. They simply transport fresh water in tanks made from resins that meet FDA specifications. NSF compliant water lines, tanks and components also available. Tanks sizes range from 300-5000 gallon sizes and are available in black, green and standard translucent. Trailers range from our standard galvanized highway rated models, goose neck and dually trailers (shown above) to manage full tank loads over 2000 gallons.